All the recipes I encountered are in Spanish so I had a hard time understanding the recipes. I did find one with pictures demonstrating how to do it but I lost it when I was finally ready to cook it. A shame! This is a reminder to bookmark, save or put a tab on the interesting recipes next time. 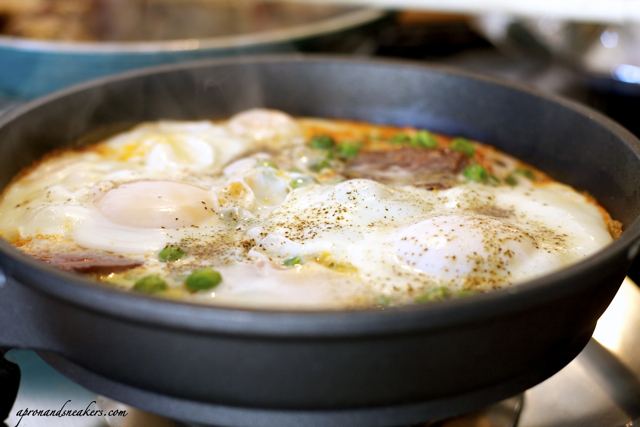 My fixation started when, after cooking a series of egg dishes for brunch, my memory was suddenly rekindled about my obsession of this Spanish egg dish when I was young. My mother used to tell me that it's not good to eat so much eggs so I remember counting the days when I can have another huevos al plato after my last. I was obsessed. I realized that I have the wrong chorizo after reading this. The Iberico is meant for eating as it is, and there is a specified kind for cooking, the cooking chorizo (of course!). But I have been waiting to have this for so long so I did not go finicky about it. I went through this recipe putting together patches of what I remembered reading in the recipe I found and from what I remembered eating when I was young. Then I found this simple recipe in English a bit too late though. When I cracked the eggs on top, I was satisfied with the outcome. That completely changed when I realized that huevos al piatto means eggs on a plate. And I remembered that when my huevos al plato is served to me, the waiter would always warn me that the plate is scorching hot. They were cooked on the plate itself. Then why are my eggs in a skillet? Because of my excitement, I overlooked the fact that they should be cooked in the oven and on a plate. So technically, it's not huevos al plato anymore. 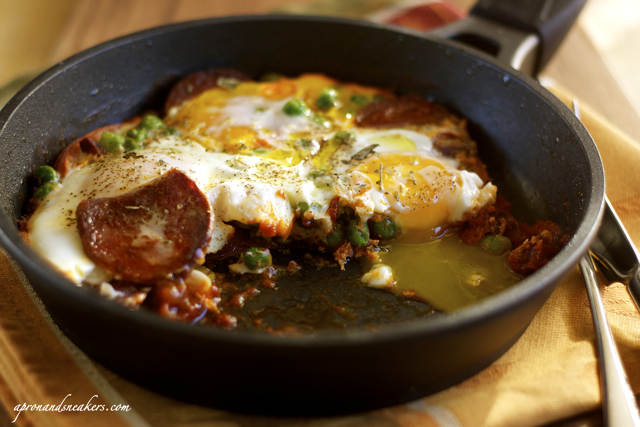 Eggs, chorizo & tomatoes in a skillet sounds more apt. 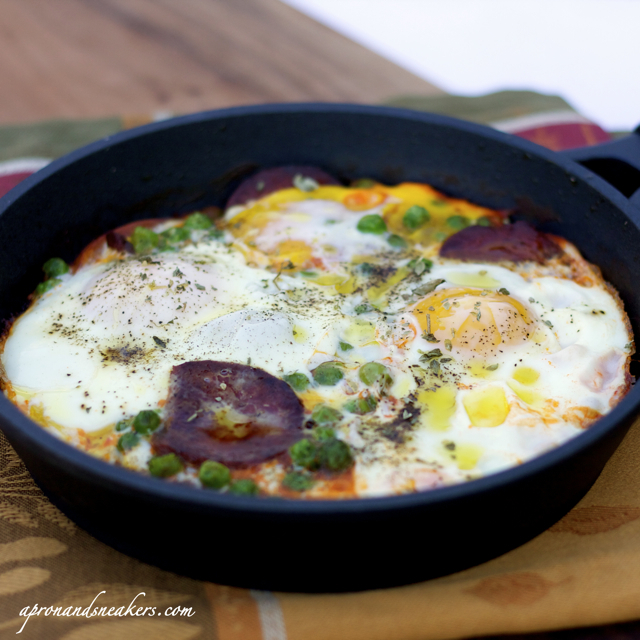 Huevos al plato, eggs in a skillet, whatever it can be called, it is a good possibility for a Sunday brunch. Enjoy your Sunday morning! 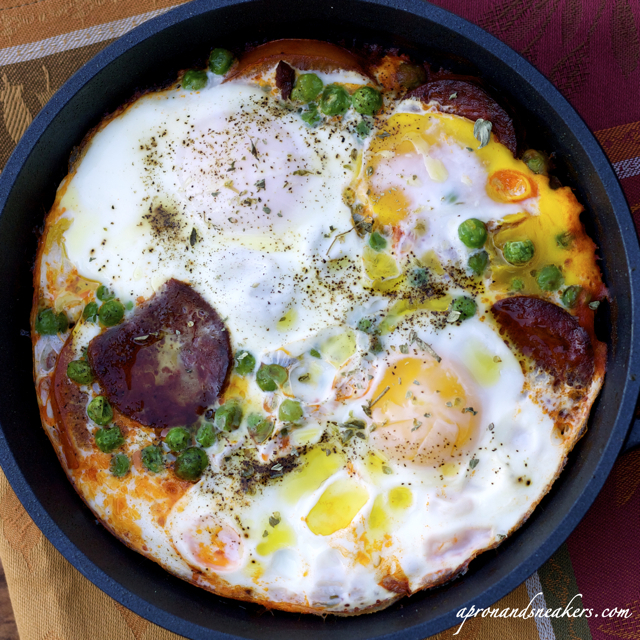 Toast the onions & chorizo (both sliced & diced) in a warm skillet without any oil. When the chorizo are toasted, remove the sliced ones and keep for later. 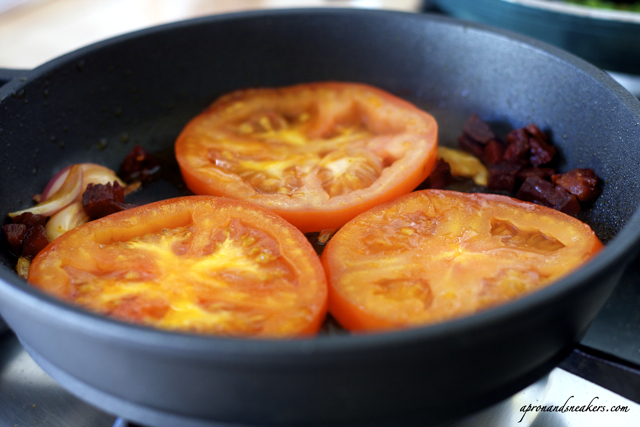 Put the tomato slices, each flat on the pan. Brown both sides. Add the tomato sauce. Let it cook for about 2 minutes. Don't stir. Distribute the green peas on top of the tomato sauce. Distribute the chorizo slices. Crack the eggs on top. Sprinkle with salt, pepper & oregano. Cover. Simmer on low fire. Cook until eggs are done. Drizzle with extra virgin olive oil. Serve on the skillet itself.